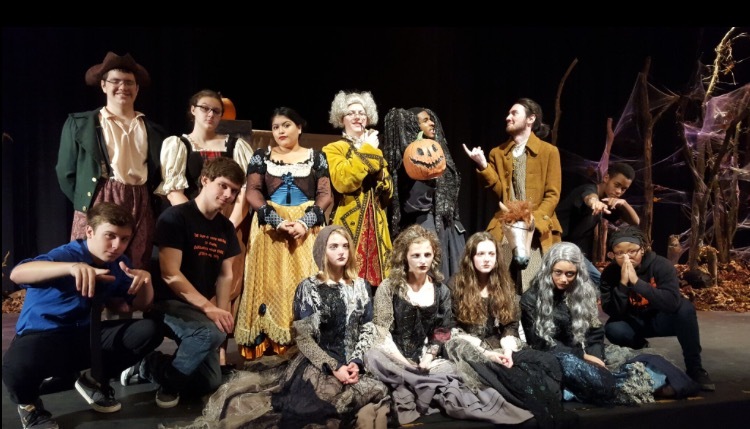 The Oakland Mills Theater Department performed the play “The Legend of Sleepy Hollow” accompanied by a reading of “The Raven” by Edgar Allen Poe on the 22 through 25 of October. The play tells the tale of the town of Sleepy Hollow, and the headless horseman who has been seen there. It follows the main character, Ichabod Crane, who is the town’s school teacher. Ichabod finds interest in the daughter of Baltrus Van Tassel, Katrina, who was played by junior Karen Torres. Baltrus, played by senior Jacob Hale, owns a very wealthy home with a very nice farmhouse and Ichabod is very interested because he also wants wealth and a nice house. As the plots progresses, Ichabod finds himself invited to a party that is hosted by Baltrus Van Tassel and finds his “favorite person” Brom Bones is there. Ichabod feels quite intimidated because Brom, played by junior Roman Saunders, is also interested in Katrina. The party is close to an end and Katrina no longer seems to have interest in Ichabod. Some people think she took another lover that night, and others think she just disappeared. Ichabod is then greeted by the headless horseman on his way home, which results in an entertaining chase. Oakland Mills senior John Platter added comic relief to the would-be suspenseful scene, as he rode a horse that was anything less than believable as if it were a great stallion. Although it is not explicitly stated that Brom Bones is the headless horseman, suspicions lead to that assumption as the witches make hints to the audience at the end of the play. Brom takes Katrina to the altar, which supports the assumption that he was behind the “headless horseman” guise. After a brief intermission, a reading of “The Raven” by Edgar Allen Poe was recited by Jacob Hale, Roman Saunders, Michael Eubanks, and Deanna Neudecker. Both the play and the reading of “The Raven” were outstanding performances. The presentation, which also included a breathtaking set and stunning costumes, dazzled audiences and set the scene for what Oakland Mills can expect from Mr. Barker, the new theater director.